The polarizing survival horror title Deadly Premonition is getting updated graphics and controls. Plenty of games have received mixed reviews from critics, but only one has a Guinness World Record for "Most Critically Polarizing Survival Horror Game." That game is Deadly Premonition, which launched for the PS3 and Xbox 360 in 2010 to review scores ranging from abysmal to perfect. Love it or hate it, Deadly Premonition is about to return in the form of a director's cut loaded with bonus content. 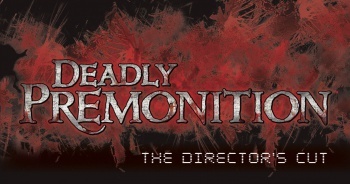 Deadly Premonition: The Director's Cut is coming exclusively to the PS3 in the first quarter of 2013. "It's been a while since Deadly Premonition was released, but I'm still receiving so many messages of support from fans around the world," Deadly Premonition director Hidetaka 'Swery' Suehiro said in a press release. "I'm writing some exciting new scenarios and adding some new features. All will be revealed over the coming months and I'm confident I can deliver an unforgettable experience for you all." In addition to the new scenario mentioned by Suehiro, the director's cut will have HD graphics, a "reworked control system allowing for an even better combat experience," and additional DLC. The re-release was first hinted at several months ago, as well as a possible sequel to Deadly Premonition. Though the director's cut is now official, the fate of Deadly Premonition 2 remains a mystery.